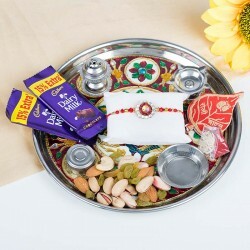 A Pooja ki Thali is just as important on Raksha Bandhan as the authentic Rakhi. A Sister carefully decorates the Pooja ki Thali for this festival. This year, order your Pooja ki Thali online from MyFlowerTree and leave it on us to make this day special for your brother. 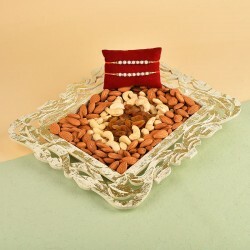 With the traditional Roli, Chawal and all other essentials, your Rakhi Pooja Thali would be ready. Raksha Bandhan is one of the purest festivals. It celebrates the bond between a Brother and a Sister. It brings them closer. No matter where they live, their love will always make them feel closer to each other. 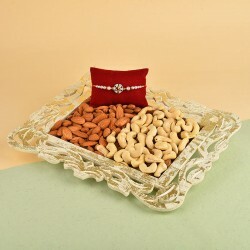 Raksha Bandhan is one of the oldest festivals celebrated by the Hindus. It is believed that it originated at the time of the Pandavas when Draupadi tied Rakhi to Shri Krishna. 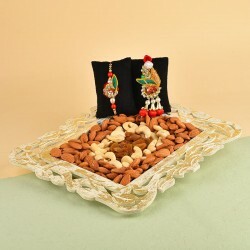 A Pooja ki Thali plays a very important role while celebrating this auspicious festival. So this Raksha Bandhan gift your brother a Rakhi with Pooja Thali and make him feel lucky to have a sister like you. 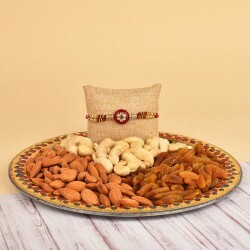 You can also send Rakhi with Pooja Thali and sweets to make the occasion all the more sweeter and special. With a Pooja ki Thali, a Sister wishes the best for her Brother. 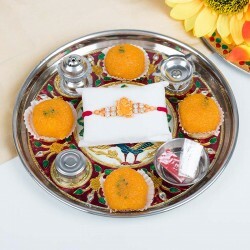 Our Pooja ki Thali contains everything that you will be needing to celebrate Raksha Bandhan. It has Roli, Chawal, Rakhi, Sweets and some Dry Fruits. Order one from MyFlowerTree to avoid last minute mistakes. Touch your traditional roots with these Pooja ki Thalis. When nothing strikes you, always go for something traditional. Make a greater impact with a gift that gives him a nostalgic feel. 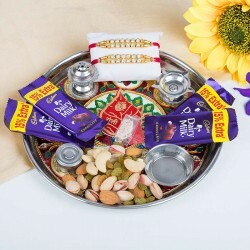 Now sending Rakhi with Puja Thali Online is just a few clicks away with MyFlowerTree. On this Raksha Bandhan, surprise your Brother with special gifts. Have a look at our Collection of Flowers which includes beautiful and Fragrant Roses, Lilies, Orchids Carnations, Gerberas and Birds of Paradise. We also have amazing Cake flavours like Black Forest, Chocolate, Strawberry, Pineapple, Mango, Coffee Caramel, Cheesecake, Chocolate Truffle, Ferrero Rocher, Coffee, Caramel, Kiwi, Fruits, Oreo and many more. If your Brother likes Chocolates, then we have KitKat, Dairy Milk Fruit and Nuts, Temptations, 5 Star, Lindt, Ferrero Rocher, Dairy Milk Silk, Dairy Milk Oreo, handmade Chocolates and Assorted chocolates just for him. Don't forget to check out our collection of Raksha Bandhan special Mugs and Cushion which you can get personalised for your brother as well. If you are looking for some Rakhi Threads for your Brother, we have exactly what you need. We have the most amazing Rakhi for Brothers. 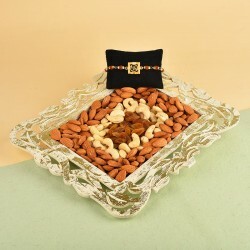 We have beautiful traditional Rakhis and Lumbas along with many amazing Fancy Rakhis like Silver Rakhi, Pearl Rakhi, Kundan Rakhi and Silver Rakhi Bracelets. We also have amazing Rakhis for Kids with characters like Doraemon, Shin Chan, Bal Ganesha, Spiderman and Superman on them. Whether it is for your little brother or older one, they all are going to love these Rakhis. If your Brother doesn't stay close to you, you can Send Rakhi Thali Online to him with MyFlowerTree. Send Pooja Thali to Chennai, Tamil Nadu, West Bengal, Rajasthan, Punjab, Haryana, Puducherry, Karnataka, Hyderabad, Chandigarh, Bihar, Jharkhand, Jaipur, Himachal Pradesh, Uttrakhand, Nainital, Assam, Kerala, Uttar Pradesh, Mumbai or Delhi with our expert delivery services across India. We also serve in many international locations as well such as UK, Australia, Sweden, South Africa, Qatar, France, Malaysia, Singapore, Canada, US, UAE, to name a few. 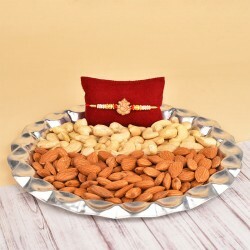 Send Rakhi Thali online anywhere in India or abroad with us and make it unforgettable for him. 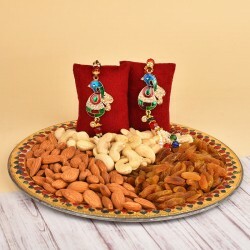 If your brother prefers something traditional, then our Rakhi thali collection is the best gift you can give to your brother this Raksha Bandhan. 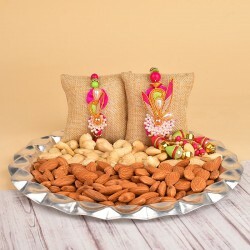 Order Pooja ki Thali online for Rakhi and make this day memorable for your brother by sending the most beautifully designed Pooja Thali to him. Products in this category have been rated 4.8 out of 5 based on 136 reviews.